Tourmaline holds a special place in the jewellery trade as this family of gems presents an incomparable range of gloriously varying colours – it is often referred to as the “rainbow gemstone”. The name ‘tourmaline’ is derived from the Sinhalese word ‘thuramali’, since these gems were first found in Sri Lanka, and roughly translates to “stone of mixed colours”. Tourmaline is classified as a semi-precious stone and refers to a crystal silicate mineral. As mentioned, the diverse colours of tourmaline are determined by their trace elements. For instance, iron rich tourmalines range from deep brown to blue-black. Those that contain magnesium are brown to yellow, while if lithium is present the gems can have colours spanning blue, green, red, pink and yellow. Some tourmalines can shift hue when the light changes from natural to artificial light or when viewed from different angles, and many types display more than one colour. With their wealth of fascinatingly diverse colours, tourmalines have more hues and nuances than most other gemstones and for this reason they tend to be a favored choice of jewellery designers. The charm of these exquisite gems is that no two are ever alike, so you can be sure of their unique beauty when wearing them. Quality tourmalines will have bright, vibrant colours - they are never dull. Most natural tourmalines display some inclusions, but these minor flaws generally do not affect the value of the gem. Nevertheless, you will always pay premium prices for a relatively inclusion-free stone. 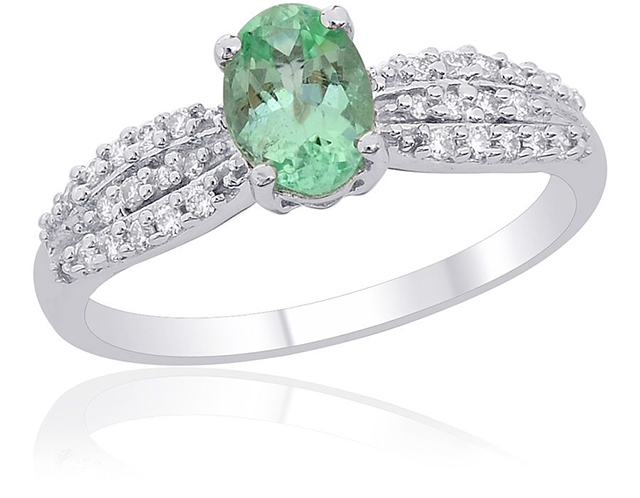 High-end, finely colored tourmalines are not always found in their many deposits throughout the world, which means the prices of these gemstones can vary greatly.